Over on PES Rankings they've got a host of daily events for players to enter across a selection of formats including Xbox 360, PlayStation 3, Wii and even the Nintendo 3DS! As well as hosting the OPE Zavvi Cup each month, PES Rankings run a number of tournaments on a regular basis where PES fans can meet, greet and most importantly, play the game we all love. Throughout January, PES Rankings are running the Greatest Football Movies XI events, five for the PS3, five for the Xbox 360 and one for the Nintendo Wii. Players who win an event will get to choose a player from the prize board to uncover a football DVD. And that's not all, everyone who enters one of these events will automatically be put into a draw to win a £50 Zavvi voucher. You can take a look at all the events that are available right here, these include monthly offline events at Glasgow, Birmingham, London and Manchester. All of the official events are sponsored by Zavvi.com with plenty of prizes up for grabs! 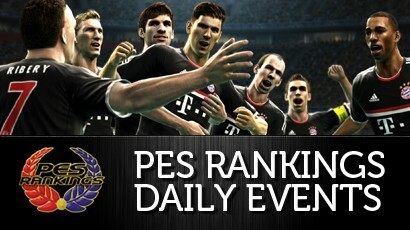 Join the community now and you could win some fantastic prizes - just for playing PES 2012! If you would like to take part in the February OPE Zavvi Cup, check back soon for you chance to play in next month's tournament, where you could win a £25 Zavvi voucher - Xbox 360 and PS3 only.